It may be that “modern” is a misnomer these days because when you’re talking about modern home décor, you’re talking about a style that has been around for over five decades. Modern décor really took off post-World War II, and was prevalent in brand new suburbs going up throughout the country. Mid-century modern homes with post-and-beam design, the idea to bring indoor and outdoor settings together with large windows, and sleek appliances and state-of-the-art materials were all selling points. Gone were over-stated Victorian or traditional doors, hardware, and cabinets. Scandinavian simplicity and natural shapes were en vogue, as were Frank Lloyd Wright and Eichler architecture to give homes functionality and make a statement. The thing is, these mid-century designs never went away, and they’ve experienced a renaissance of sorts over the last decade. But, beyond über-modern signature furniture pieces, like the Eames lounger or Noguchi coffee table, how does modern décor extend to the interior of your home, specifically the bathroom? Most people who are devotees of mid-century modern, or just modern, design don’t usually go half-way. This is more than just an aesthetic for many people; it can fill up their lives as they track down authentic furniture, paintings, and knick knacks that are central to tying rooms together. Retro is important to them. However, plumbing has come a long way since then, and it isn’t necessary to try and track down a sink made during the post-war boom. Plenty of manufacturers create beautiful modern appliances for your bathroom that will fit in any home with a focus on modernism as a theme. You can have a modern bathroom, or you can have an ultra-modern bathroom. Some modern looking amenities will seem fairly traditional in their style. Most people grew up in these kinds of bathrooms, and many of our parents or grandparents still have this kind of look to the room. However, for those who are looking for a modern bathroom to match their modern kitchen, there are some ways to make these rooms match the theme. Modern bathrooms are minimalist in design. While some bathrooms want the focus to be on the bathtub and shower combo, or the oversized vanity, modern décor works because it blends the walls and appliances into a natural style, much like the Scandinavian designers were hoping for 60 years ago. Bathtubs, showers, and sinks may appear as if they flow out from the floor or wall. Color and tones are often natural or basic. But even this simplicity is a major statement. As with any kind of bathroom or home décor, you don’t need to have the architecture, or bones, of a home to do what you want. While we’ve all seen homes whose architects gave them obvious modernist designs, even someone living in a well-preserved early 20th century bungalow can create a bathroom that is completely modern. As bathroom remodels go, it might even be easier to work modern looking appliances into smaller rooms that would be hard pressed to fit traditional tubs and toilets. However, oversized bathtubs may be just what you need in your bathroom. While style is important, so is the utility of space. 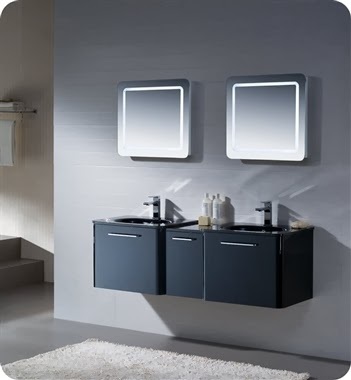 Floating vanities, sinks, and toilets will work well in a modern bathroom. Mirrors may seem basic when compared to those with traditional borders, but mirrors with simple borders with straight lines will work; mirrors with LED lighting and fog-free systems are even better. Steam showers may still seem like a luxury to many people, but in a modern bathroom, they fit just as well as a bathtub-shower combination. Simplicity in style doesn’t have to mean going barebones on luxury or indulging in what you want. Master bathrooms and half-bathrooms can both benefit from a modern décor makeover, especially if you are updating other parts of your home. The bathroom, like the kitchen, is a room that is used every single day. It’s not too difficult to extend the modern theme throughout your home, even if its design is closer to Victorian or Craftsman. Modern lines in both appliances and architecture are cleaner and more straightforward than are traditional or antique designs. There is less “clutter” in modern décor. Yet, because this style has been around for a while now, there is still a sense of history behind it. Instead of simply being eclectic, or possibly eccentric, modern décor can be the envy of your family and friends.